I am pushing way beyond my graphene-thick understanding of microprocessor and internet addressing technologies, but I am intrigued by stuff I have heard recently, and hope that someone out there can shed more light on the subject. Current chip technology mostly works in 64-bit ‘words’. In other words a chip can process a single 64-bit word, or two 32-bit words every cycle. That’s handy, because a 64-bit processor can deal with two internet addresses that conform to the 32-bit IPv4 internet addressing scheme at the same time, speeding up data flows around the internet . Actually, because IPv4 and IPv6 will co-exist for a long time to come, probably it will take even more cycles to resolve an IP address because the processor must translate addresses between the two incompatible schemes. In addition, router tables, the automated IP address databases, suddenly become much bigger. From looking for a needle in a haystack for an IPv4 address, digital postmen are now looking for the equivalent of Higgs’ boson. According to telecoms consultant Martin Geddes, the internet is likely to become less reliable, not more, as packets start to queue, waiting for microprocessors to figure out the next leg of their journey across cyberspace. 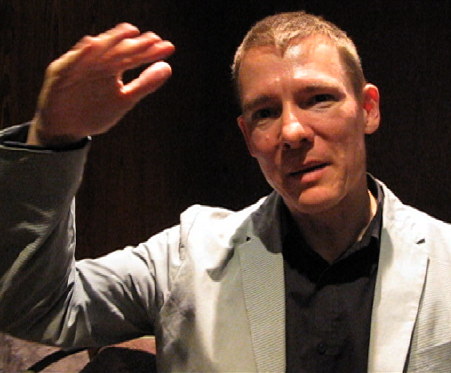 Geddes advocates we re-engineer the internet using RINA – Recursive InterNetwork Architecture. But he also says a commercially viable use of RINA is 10 years away. Now is a good time to start planning the transition, or at least how to splint the fundamentally broken internet with something more robust. Of course, the for-now answer is to build 128-bit processors specially to cope with IPv6 addressing. Chips with 128-bit floating point registers have been around for quite a while, mainly for high performance computing like counting molecules or decrypting Skype calls in real time, apps that need a high degree of accuracy. But resolving internet addresses has, until now, not really been an issue. It’s going to be, so how are we going to do it? Ever since the government’s digital engagement czarina Martha Lane Fox told Twitter that she’d dropped her mobile phone into the lavatory, it’s been clear that some Britons are addicted to their communicators. Communications regulator confirmed this on 4 August in its 2011 Communications Market report. It found almost four out of 10 adults and six out of 10 teenagers admitted they were “highly addicted”. The study shows a massive shift from fixed line communications to mobile, as well as huge growth in mobile data traffic. The number of mobile voice minutes has grown by 250% over the past decade from 35 billion to 125 billion a year, and text messages have increased from 7 billion to 129 billion per year. Mobile data traffic has skyrocketed 40-fold since 2007, Ofcom said. Despite BT saying it added some 87,000 new copper lines over the past two or three quarters, Ofcom found that the percentage of UK homes with fixed lines dropped from 93% in 2000 to 81% today, and one in seven homes were “mobile-only”. 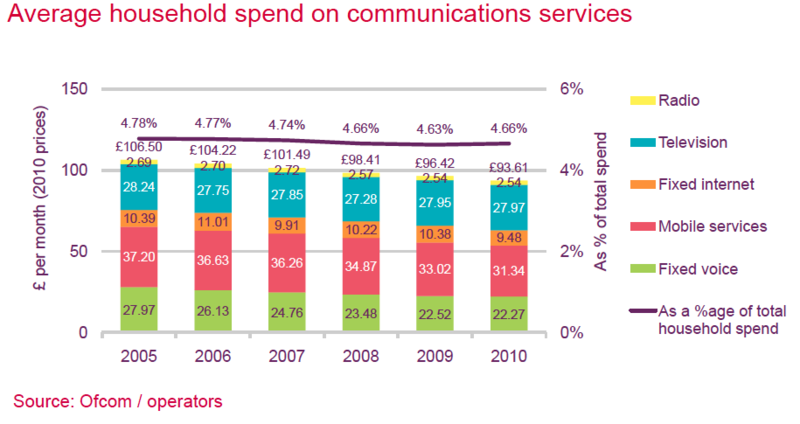 Overall revenue from telecommunications was down 2%, Ofcom said. Mobile revenues were up 1%, but fixed voice and broadband revenues dropped 3% and 6% respectively, largely due to competition and regulatory action. However, 26% of advertising spend is on the internet, marginally ahead of television. Internet advertising spend grew by 16% in 2010 to over £4bn, and mobile advertising increased by 121% in 2010 to reach £83m. A striking feature of the market has been the switch to smartphones, with its implications for a big shift in traffic patterns and hence network build. Almost six in 10 people who have a smartphone acquired it with the past year. As a result, 27% of adults and 47% of teenagers now use a smartphone, Ofcom found. Smartphone users make a lot more calls and send more texts than regular mobile users. 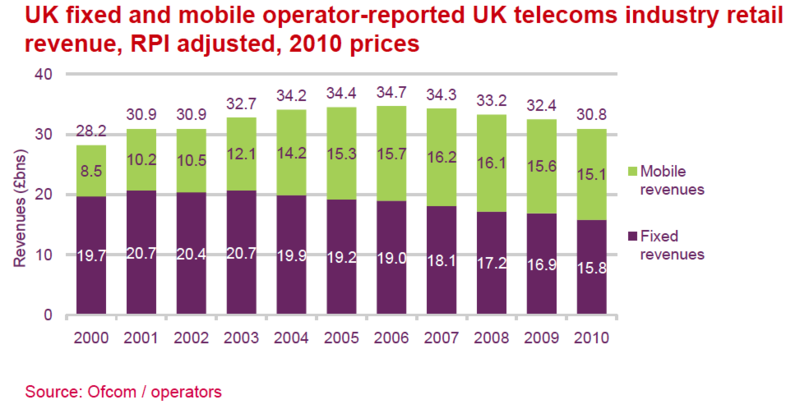 Ofcom said 81% of smartphone users make calls every day compared with 53% of “regular” users). “Teenagers especially are ditching more traditional activities in favour of their smartphone, with 23% claiming to watch less TV and 15% admitting they read fewer books,” Ofcom said. Usage figures reveal the development of an “always-on” culture. Eight out of 10 smartphone users have their mobiles switched on all the time, even in bed. Over half (51%) of adults and two-thirds (65%) of teenagers admit using their smartphone while socialising with others, nearly a quarter (23%) of adults and a third (34%) of teenagers have used them during mealtimes, and over a fifth (22%) of adults and nearly half (47%) of teenagers admitted using or answering their smartphones in the bathroom or lavatory. This extends to fixed networks too. Just over three-quarters of homes are now connected to the internet compared to one-quarter in 2000. 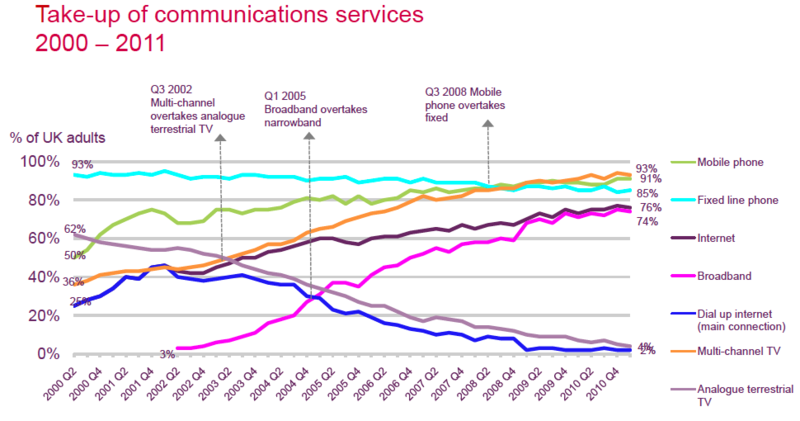 Total UK broadband take-up increased by three percentage points to 74% by 1Q2011. The largest increase in adoption was from those using fixed services, mainly among older age groups, Ofcom said. By May 2011, around 500,000 households had adopted superfast (greater than 30Mbps) broadband, a fivefold increase from 2010. Nearly six out of 10 homes were “passed” by either Virgin Media’s cable service or BT’s fibre to the cabinet Infinity product. People were happier with their high speed service that their previous broadband by eight to six, with most high speed users saying they were more likely to use it to download high definition video.